T-fal : Tefal, the non-stick cookware inventor, is a world leader not only in cookware but also in small domestic equipment: steamers, toasters, deep fryers, steam irons, pressure cookers,... For Tefal, home is a source of accomplishment and shared happiness. Visit Tefal sites and discover ingenious products which offer success in what you undertake. Michele from T-fal scent me the amazing FV4476 T-fal Ultraglide Easycord Iron Steam Iron from T-fal, I have been using for a little while now and it has become my 3rd hand! if you are like me you love to iron but hate doing it because of current or past clothes irons, right?..or you hate to iron but have to do it but you hate your clothes iron you use. Rather it be because the steamer doesn't work, or the cord get in the way, or your iron just doesn't do the job you need it to do..I'm with you! I have used plenty of irons in my life starting out when I was little and always wanted to help my mom with chores. So the first thing I would do to help her in her busy days is to help iron clothes. She had 4 kids and took care of my sickly grandfather, it was the least I could do to help. I remember the cord always, always getting in the way. Burning myself because the soleplate would catch on the clothing and when I would put push it hard it would unhitch and would my arm or hand. And you would have to watch the temperature because you would have iron shaped burns on your clothes. 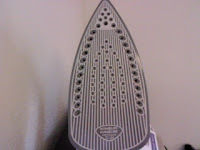 As I got older I had more modern Steam Irons but would still have problems with them. It was a big hassle that I didn't want to deal with. Now that I'm older and married I still hate my iron. I got to the point where I would water down big fluffy towels and throw them in with my dry clothes to unwrinkle them. I don't really like to do that because then my clothes had a slight over warmed smell on them. Now that I have discovered T-fal Steam Irons, I will never go back to horrible useless Irons again!. 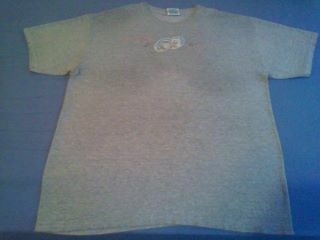 Before : T-fal This is my favorite casual shirt, as you can see in the picture I have put my T-shirt through the ringer. 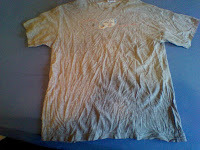 I have done everything possible to wrinkle this shirt up! I put special care of wrinkling my trouble spots..You know the area around the arm pits. 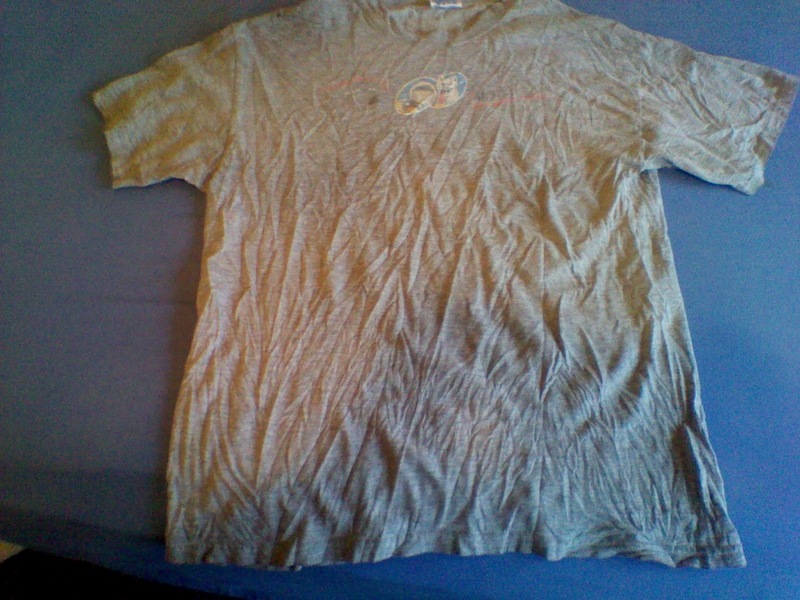 the area where it the most dificult to iron because no matter how much you iron it, it manages to re-wrinkle..You know the area right..
After : T-fal as you can tell this is the same shirt, but smooth as a well..you know. It's like day and night right? as you can tell from the before photo I put that shirt through hell. for it to come out smooth and without one wrinkle in it. 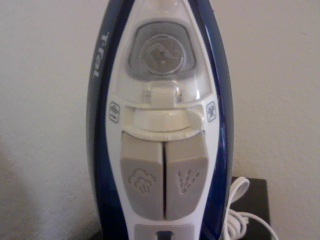 I love my T-fal steam iron don't you?.. The first thing that caught my eye was the bright pretty color of this steam Iron. I'm used to the plain silver coated irons. 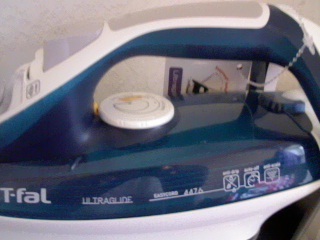 This T-fal steam iron iron has the modern touch of color that I really like. I feel updated and chic' while ironing my husbands clothes and pants. The bright clean aquamarine color is also clear, so you can see how much water is maintaing in the steamer iron so you don't have to second guess. I love the fact that my T-fal has a scratch resistant non-stick bottom. As I said in my intro I have had previous irons stick to clothing and it was not a pretty sight. 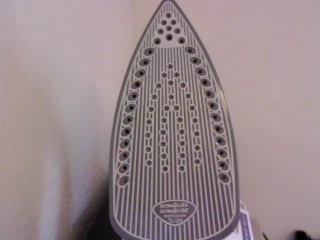 I love the fact that it is scratch resistant, because I put my steam irons to work, and they work hard. It's just my Husband and me for now but we have alot of clothes. He has regular clothes and work clothes. and me being a woman naturally have tons of clothes. I do 3-4 loads a week. 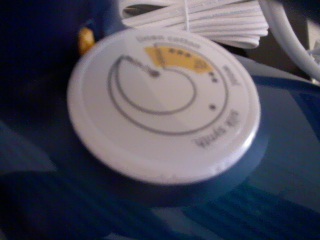 I love how big the steamer and water jet button is. My previous clothes Iron had little buttons and they were hard to use from day one. With big bold buttons like these anyone would be willing to use it. Older people who are not as nimble as they used to be, like my grandmother would be able to use this without any help or frustration. This would be a great gift for her this coming year. I love how big, bold, and easy the dial is to use on this Steam Iron, my previous iron was so difficult to understand and use when I first got it. Irons should not take 5 people trying to understand the directions on what setting to use to iron cotton, silk, or wool. It's easy to understand and is in bold print. The dial click when moved so you know exactly where it is when you want it. 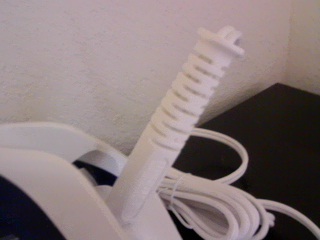 Remember me saying how horrid it is to use an iron when the cords get in the way. I makes me want to scream. 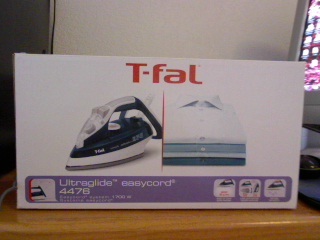 T-fal has made wonders of their steam irons and made a adjustable cord! 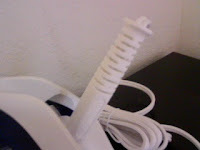 no more cords getting in the way, You can flip the cord baste to the top of the iron to set the iron down, move it to the middle for easier access, or you can flip the base to the bottom for more ironing comfort. the cord moves with you, not you move with the cord. that is pure Brilliant! I wish this was invented along time ago. ♥ I received no monetary compensation for this review. I was provided a T-fal steam iron to try and give my honest opinion(s).